Endgame Characters Accidentally Revealed on IMDb? IMDb has never been the most reliable source for movie spoilers, as some film pages get updated that aren’t quite accurate. But the page for Avengers: Endgame now points to a number of surprise characters that haven’t been confirmed. And it sounds legit, with some of the extras in question seemingly verifying that this Phase 3 ending sequel will indeed include time travel. Or, at the very least, some interesting flash backs. First up is Tilda Swinton, who played the Ancient One in Doctor Strange. It was in that standalone adventure where she met her ultimate fate. Now, IMDb claims the Ancient One will rise to fight again, with Tilda Swinton returning for her second MCU appearance. This definitely indicates that strange things are afoot at the Circle K. Do the other Avengers seek her help via time travel? Is she an ascended ghost? Or are we going to get a flashback to Doctor Strange’s origin story? Tilda Swinton isn’t the only character seeming confirmed for the cast. Not surprisingly, every major Marvel superhero that was decimated by Thanos’ mighty snap is in the movie. This one we expected. They weren’t going to keep so many iconic characters on ice. Especially considering that Spider-Man, Black Panther and Doctor Strange are all set to get sequels, and none of these actors are getting any younger, so prequels for any of them sound a little iffy. One other name that appears in the newly revised cast list is Frank Grillo as Crossbones. This shouldn’t come as much of a surprise as Grillo has been teasing his return for years (yes, years) now. Grillo was also one of the first actors to hint that time travel and flashbacks are definitely in play, and it’s been strongly rumored that scenes from Civil War will be revisited and revised by the characters on screen. Crossbones was definitely killed off in Civil War, so Avengers: Endgame may play out like a Best Of album at this point, revisiting the entire franchise’s best and brightest moments. 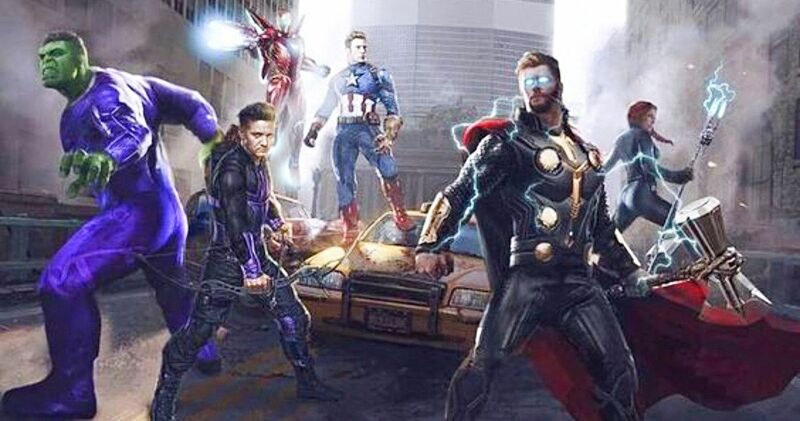 There are a few other clues that time travel is definitely happening in Avengers: Endgame. The listing goes onto include a number of S.H.E.I.L.D. agents. The secret government team was disbanded within the MCU movies following the events seen in Civil War. It’s a little hard to believe that all of this is just flashbacks. That doesn’t sound like any fun. There are a couple of secondary characters, or rather extras, that also heavily point towards time travel. There is a new character called ’70s Car Girl #1′ who sounds intriguing on a number of levels. And there is also a ‘1970s Scientist/Lab Worker’, neither of which we’ve seen before to be included in a scene restoring flashback. So what is really going on here? Pretty interesting stuff. Another rumored character also appears to be returning, though most likely in modern day. Ty Simpkins, who played the kid in Iron Man 3 is supposedly back. He was 12 when that sequel was shot, and he’s since grown into a 17 year old. It will be a little hard to de-age a fully grown teenager into a tween, so it’s expected that Harley Keener is sought out by Tony Stark for help. And could even tie into some of these time travel scenerios being thrown around. So does this mean Harley survived the decimation? All signs point to yes. This all sounds very exciting, but Marvel has not yet released an official cast list for the movie, indicting which characters are truly back in the fold this time. We know from the trailer that Robert Downey Jr. and Chris Evans will definitely be reprising their roles as Iron Man and Captain America for what may be the last time. Scarlett Johansson will be back as Black Widow, alongside Chris Hemsworth as Thor, Jeremy Renner as Ronin, Mark Ruffalo as Bruce Banner, Paul Rudd as Ant-Man and Karen Gillan as Nebula. But other than that, this IMDb page is all we have to go off of. And the sad fact is, this could all be erroneously posted, as we’ve often seen misplaced actors on the site before. Though both ’70s Car Girl’ and ‘1970s Scientist’ seem oddly specific and not smoothing that would accidentally get uploaded. Four major characters not currently listed on the Avengers: Endgame page include Tom Hiddleston as Loki, Paul Bethany as Vision, Idris Elba as Heimdale and Zoe Saldana as Gamora, all confirmed to be dead, or have died on screen in Infinity War. You can check out the IMDb page in question, which also points to a heavily military presence, students from Peter Parker’s high school and college students all making an appearance, all listed alongside the actors who play them, so there seems to be a bt of authenticity to this after all.